It’s as hard to imagine an office without access to e-mail as it is to find a large business where employees don’t use the company server for personal communication. If you are a manager, business owner, or IT specialist, you should know that there is a simple, quick, and inexpensive way to maintain control of the corporate e-mail system. 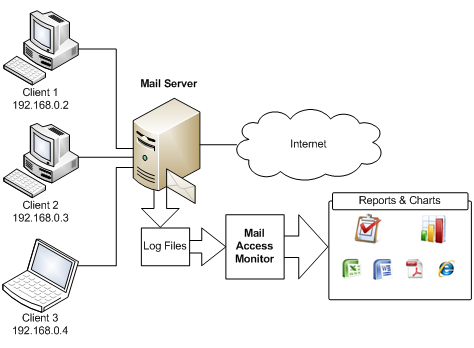 Mail Access Monitor is a simple tool that analyses mail server logs and shows how much traffic is being used by e-mail, who sends and receives most messages, where the messages are being sent, and if e-mail abuse takes place in your office. The program works with all popular mail servers (MDaemon, Kerio MailServer, Merak Mail Server, MS Exchange Server, VisNetic MailServer, CommuniGate Pro, SendMail, PostFix and QMail) and builds charts that are easy to comprehend.